As a student on the Easter retreat, you will participate in a living process which gives you the opportunity to discover new dimensions in yourself. The retreat is a process in which all aspects are equally important. Only participate in the retreat if you are prepared to follow the whole retreat. 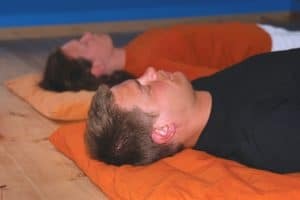 You will also have the possibility to keep Mauna (silence) 24 hours on the Easter retreat. Two or three times we will have Sauna with bathing in the sea. Cancelling your booking: Cancellation must be done in writing either per mail or email. When cancelling later than 1 month before the course you will have to pay NOK 1.250. Later than 14 days NOK 2.000 and later than 1 week before NOK 3.000. If you cancel the booking after the start of the retreat you will have to pay full price. Cancellation due to illness: Attach medical certificate or doctors statement which verifies your illness, and you don’t have to pay for the retreat. Just click the Quickview button for direct enrollment or click the image above and you go to the more detailed enrolment page. We accept secure payment with VISA and MASTER credit card. After enrolling we will email you a confirmation with further information on how to get here by car or bus from Bergen. Times: The retreat starts Wednesday evening at 6.30 p.m. and ends Monday at 1 p.m. The retreat is intensive – but you still have time to enjoy the countryside, go for a walk, reading, etc. 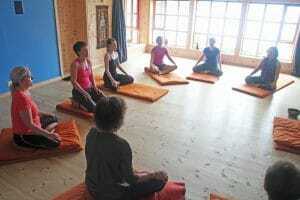 The retreat costs NOK 7.200 and includes teaching, board (vegetarian food) & lodging. Single room can be booked at an additional cost of NOK 336 per night. As there is a limited number (and they get booked early) please contact us per email for further information.